Three people identified as Elizabeth Christen, Eleanor Christen Peterson, and Fred Christen standing beside a communal residence, Amana, Iowa. 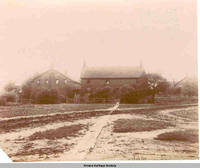 View of school buildings from the road and looking west, dirt road and wooden sidewalk visible. 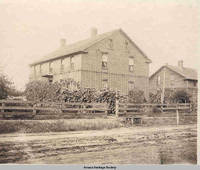 A man standing in front of a communal residence, Amana, Iowa. 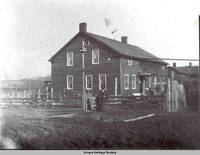 Two women and one child (not members of the communal society) standing in front of a communal residence in Amana, Iowa.